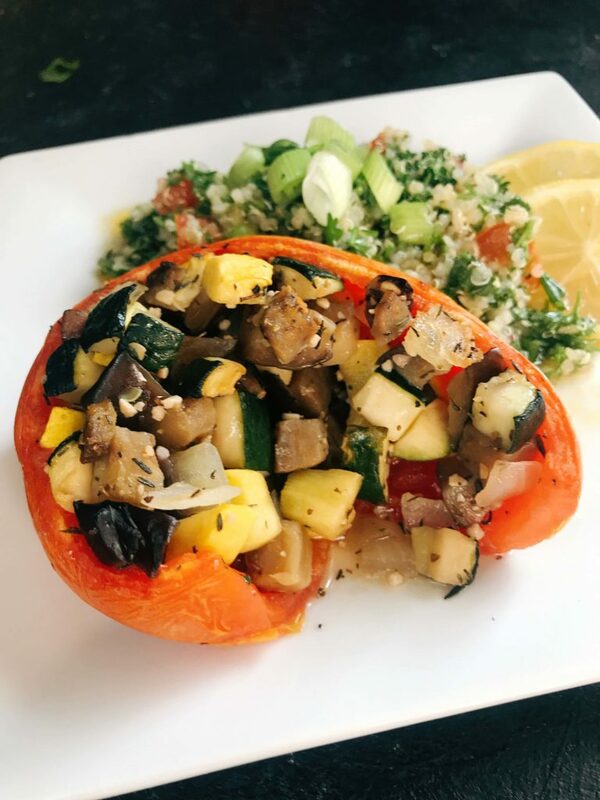 These Vegan Ratatouille Stuffed Tomatoes are a healthy and filling meal option. 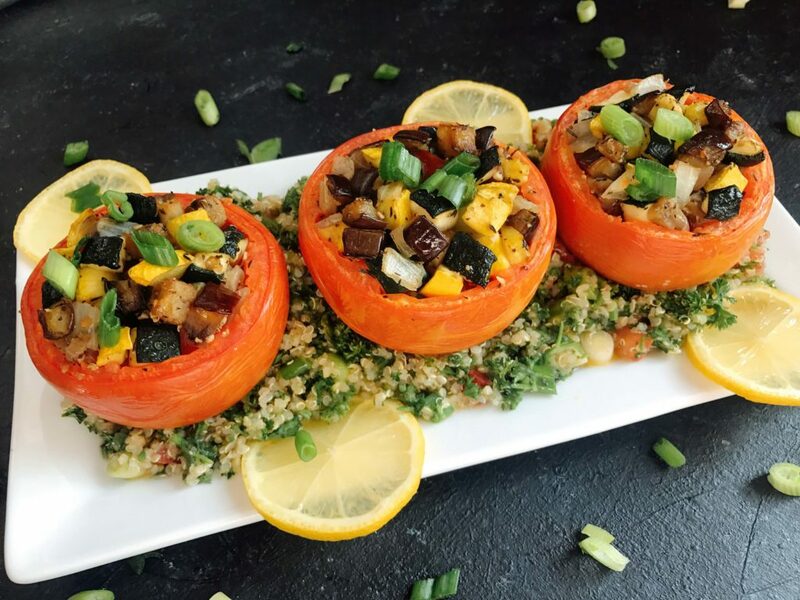 Large beefsteak tomatoes are stuffed with eggplant, squash, and onions for a twist on a classic dish. Ratatouille is French and has a few different variations. Typically it contains tomatoes, onion, eggplant, and squash. Most of the time I see ratatouille either layered in slices like a sideways scalloped potato, or simply chopped up and cooked together. Since tomatoes are pretty typical in ratatouille, I figured it would be fun to make a stuffed tomato version! 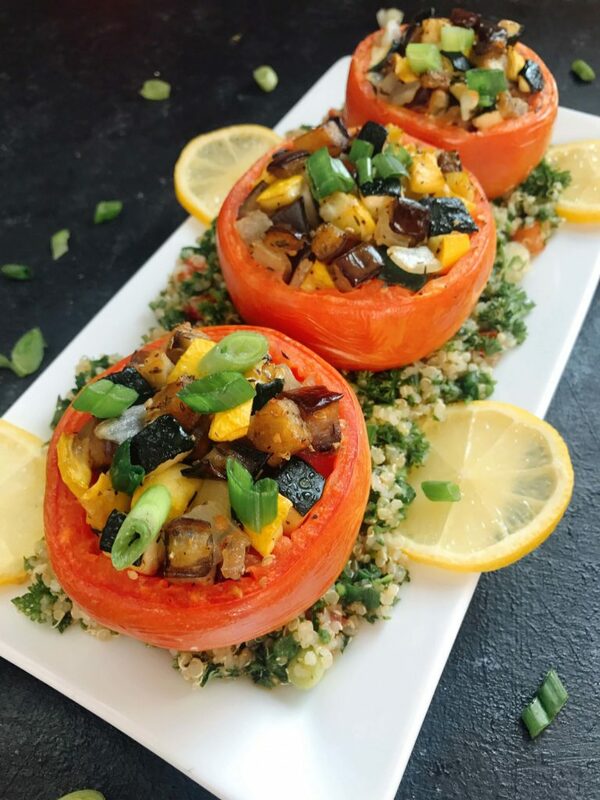 These Vegan Ratatouille Stuffed Tomatoes are a great healthy meal. They are also gluten free (GF), Whole 30, and Paleo. I like to serve them with my Vegan Quinoa Tabbouleh for a fresh and healthy side. You can use any combination of the eggplant, zucchini, and yellow squash as you prefer. I tend to go heavier on the zucchini, but this recipe starts with a balance of each. 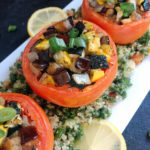 Vegan Ratatouille Stuffed Tomatoes are made by first scooping out the inside of large tomatoes and letting them drain. This prevents them from getting too soggy and soft later on. Meanwhile, the ratatouille filling is sauteed. When the tomatoes have drained, they are stuffed with the mixture and baked for 20-25 minutes. These tomatoes are sitting on a beg of Vegan Quinoa Tabbouleh, which is the perfect side for this dish! The tabbouleh is full of bright and fresh flavors. Grab the recipe for this Vegan Quinoa Tabbouleh here! 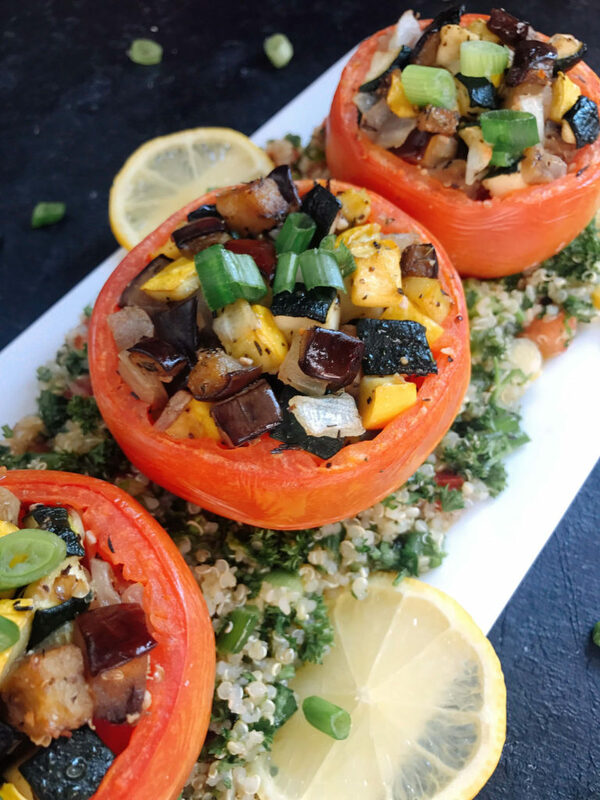 The Vegan Ratatouille Stuffed Tomatoes are so hearty and filling, especially with the Vegan Quinoa Tabbouleh, that even meat eaters will be satisfied! Have you ever had ratatouille before? 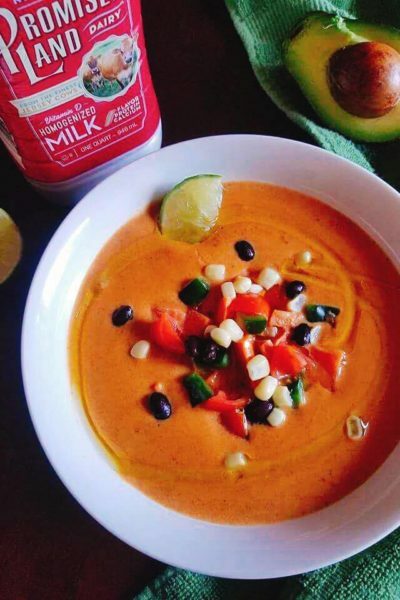 It is not very common to find, whether in restaurants or homes, but is a classic combination of flavors. This healthy and unique spin is a great way to start the New Year off right! This hearty vegetable dish is vegan, gluten free, and paleo. Cut the tops off of the tomatoes approximately 1/4 inch down. Scoop out the insides of the tomatoes (I found this easiest with a melon baller, but you can also use a spoon). Sprinkle the inside of each tomato with salt. Place the tomatoes upside down to drain on top of paper towels on a plate. Let them sit for 30 minutes. (This is an important step because it will remove extra moisture, preventing the tomatoes from being soggy later on). Meanwhile, make the ratatouille filling. Chop the eggplant, zucchini, and yellow squash into 1/4-1/2" pieces. Heat the olive oil in a large skillet over medium heat. When hot, add the eggplant, zucchini, squash, and onion. Cool until tender, approximately 7 minutes. Add the garlic, dried thyme, salt, and pepper. Stir and cook until fragrant, approximately 1 minute. Take off the heat and set aside until the tomatoes are done draining. 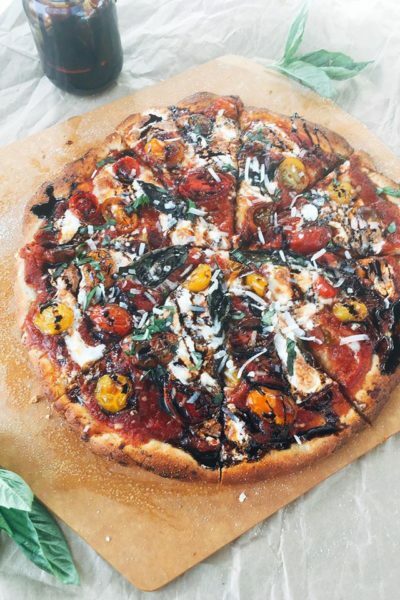 When the tomatoes have been draining for 30 minutes, use a paper towel to dab the inside of each tomato dry. Stuff each tomato with the ratatouille mixture. Place the tomatoes in a baking dish. Bake the tomatoes for 20-25 minutes until the tops are starting to slightly golden. 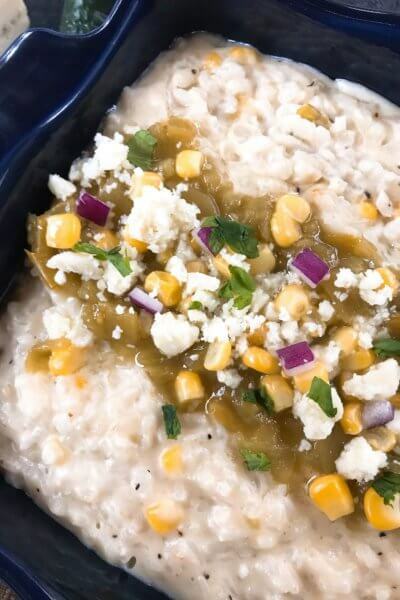 Serve immediately with your favorite sides. Aim for a total of one pound in weight between the eggplant, zucchini, and yellow squash. Use any ratio you would like. The exact amount of filling you need will vary with the size of your tomatoes. Grab the recipe for the Vegan Quinoa Tabbouleh here! 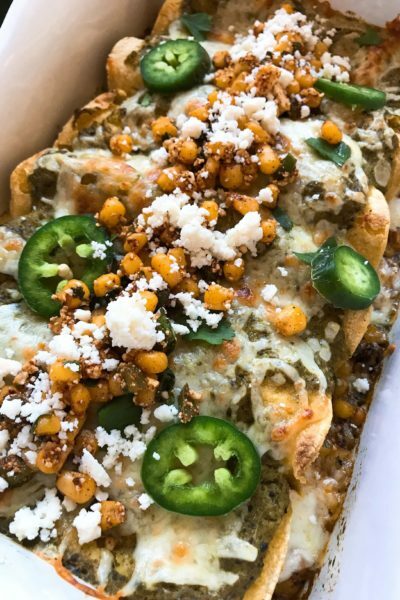 Yum…These look and sound delicious! 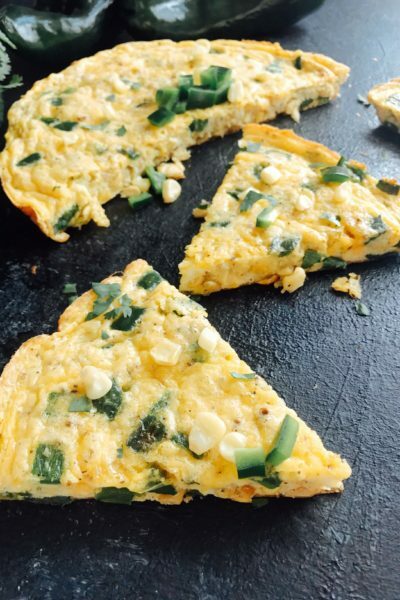 Love how you stuffed these with sooo many good veggies! So much flavor in such a small package. They are so colorful and impressive. That’s very interesting, I’ve never had stuffed tomatoes before but now I’m thinking how the possibilities are endless and so many different fillings would go! Really great idea to put ratatouille inside fresh tomatoes. I’d love getting my daily dose of veggies this way! What an interesting take on ratatouille! I’m also a sucker for stuffed tomatoes, so this is definitely up my alley. Can’t wait to try this!